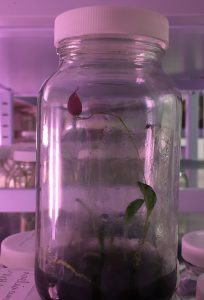 Lepanthes is a fascinating genus of mostly miniature orchids from tropical South and Central America that use deceit pollination similar to our native bee orchid by mimicking the sexual parts of a female fungus gnat to attract a male that pollinates the flower. 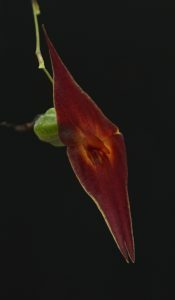 Lepanthes elegantula is one of the larger flowered species though still a small plant and the species is rarely out of flower on it long thin successively flowering spikes. As you can see we have a seed pod on one of the spikes so I guess one of the greenhouse gnats was tricked by a flower over the winter. The species is native to cloud forests in Ecuador from 2800-3300m altitude and so we we grow plants in Cool America, in a wet and shady place, away from sunlight. 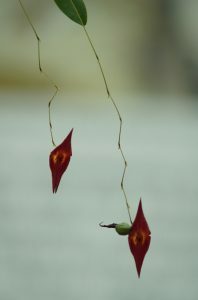 We have seen lepanthes species in Costa Rica and always find them in mossy, dark, damp conditions. Let’s hope we have lots more viable seed to sow from the current seed pod.